It’s the first new moon of the new year as I sit down to write. What better time to kick off a series of mindful self-compassion blog posts! I’ve been wanting to do this for a while and waiting until the time felt right, and that time is NOW. It seems so many people are so anxious lately, and in times of stress, we need more than ever to give ourselves the gift of our own kindness and compassion! I’ll admit right out of the gate that I’m a recovering perfectionist who has struggled with self-worth all my life. I made Self-Love my theme for 2017, not knowing exactly what to call it because the term carries selfish, narcissistic connotations, and that wasn’t at all what it meant to me. I realized I’ve spent the past 23 years caring for others in my roles of mother, partner/spouse, daughter, and early childhood educator. I’ve also struggled with personal boundaries, compared myself to those who seemed to have what I felt I was lacking, and (along with that) tended to put people on pedestals. Not exactly self-esteem boosters. Finally, I realized something had to change! I’d become so good at caring for and seeing the good in others and not so good at doing the same for myself. Putting my own needs and desires on the back burner was holding me back in a big way. I needed to achieve a better balance between caring for myself and others. So that’s what I did for the past year, and it was truly transformational! I’m excited to share what I’ve learned. I thought I’d begin with three simple rituals I do every morning that have made a big difference. Rather than rushing into the day and what needs to be done, taking a few mindful minutes to honor myself reminds me of my inherent worth and helps me to start the day in alignment with my true self. For years, I didn’t make my bed. Didn’t give it a second thought. I’ve been going to Light on the Hill retreat center for individual retreats my entire adult life. At the end of the retreat, you’re expected to remove your bed sheets and make the bed with fresh sheets for the next retreatant. The instructions are to make the bed as if you’re preparing it for your beloved – with intention and a warm heart. Last spring, after decluttering the entire house, I splurged and bought a nice, king-sized bed. Getting rid of lots of clutter created space for what I really want in my living environment. The process generated lots of clarity around who I was, who I am, who I am becoming, and what/who supports the vision I have for my life. Waking up every day feeling rested was the foundation upon which everything else…um, rested. I had been sleeping on hand-me-down beds for a long time, and it was high time to get a better bed. It was a reward I gave to myself after the epic decluttering journey during which I acknowledged how important a comfortable bed is to good sleep and overall well-being. I used some money I had inherited from my parents and felt it would please them to know I did something nice for myself. It made my back happy, too! Now that I finally had a nice bed, I wanted to take care of it. 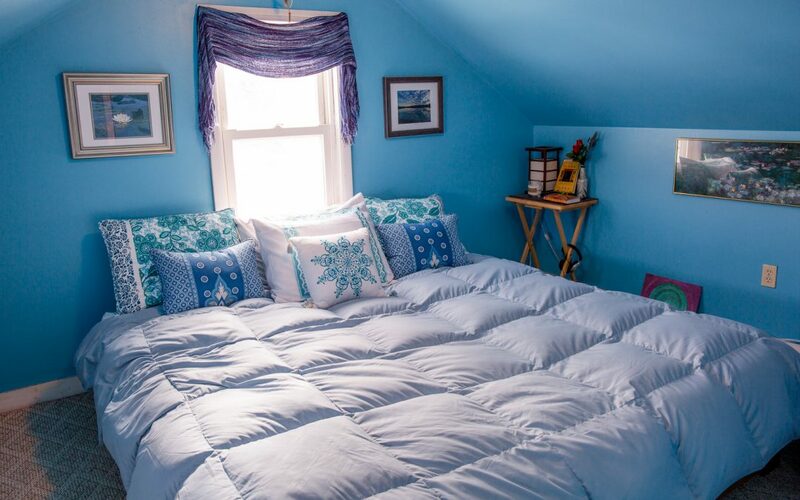 I recently had gone on retreat and recalled the practice of making the bed for the next person and decided it would be a beautiful, loving gesture to do for myself. So now I make my bed with love and intention every morning, fluffing the pillows, arranging them just so, and brushing off any debris, to prepare it for another inviting and restful night’s sleep. Whenever I walk into the bedroom and see my bed, I appreciate the gesture and feel loved. It really makes me feel happy, uplifted, and grateful. Making my bed is not an obligation or chore. It’s a joy. As I do it, I think of how great it feels to walk into the room when the bed looks tidy and beautiful. It’s a little thing that makes a big difference. This next morning ritual might sound a little weird. There is a mirror outside my bedroom, and after making my bed, I greet myself in the mirror with a big smile and loving words. Last year, I worked my way through Cheryl Richardson’s book, The Art of Extreme Self-Care. Each chapter in the book offers a strategy to practice for an entire month, and one month, it was mirror work. At first, it felt a little awkward and reminded me of the Stuart Smalley skits on Saturday Night Live. But I was committed to practicing the exercises in the book and gave it a try. It ended up being the most powerful practice I experimented with from the book, especially because I’ve had body image issues all my life. When I looked in the mirror, I did so critically, noticing what I perceived as flaws. Flaws seen through a magnifying glass! Looking in the mirror was not a feel-good activity. After greeting myself with loving words, I look in my eyes and state positive affirmations that I have posted around the mirror. It might sound corny, but these affirmations are deeply meaningful reminders I want to attune to every morning…and it works. I really look forward to this ritual! It’s like tuning an instrument, and the instrument is my mind. Now, quite unbelievably, looking in the mirror is an opportunity for loving kindness and to affirm who I really am and what is most important to me. More often than not, when I look in the mirror throughout the day (not just when I do the “mirror work”), the loving voice intercepts the critical voice, which is rather miraculous! It’s as if I have trained myself to see who I really am rather than compare what I look like to how I think I should look. I just don’t do the mirror work when anyone else is around…or if they are, I do it quietly! Next, I go into the kitchen and drink a cup of warm water with the juice of half a lemon and a dash of cayenne. This is little reminder to be mindful of what I put in my body. Apparently, warm lemon water has health benefits, and it’s a simple gesture that only takes a couple minutes from start to finish. It feels like a healthy, cleansing way to start the day. It reminds me that my body is a temple, and I begin the day treating it as such. That is the intention behind this ritual. Doing these three rituals affirms every morning that I matter and have positive worth. It makes me feel good about myself. All these activities are done with a sense of joy, not out of obligation. It feels good to walk into the bedroom when the bed is made up beautifully. It feels good to smile and say kind and loving words to myself while looking in the mirror. And it feels good to begin the day conscious of what I put in my body. Altogether, these three rituals only take about 10 minutes! If time permits – especially on mornings when I don’t have to get ready for work right away – another morning ritual is sitting on the side of my bed and looking at my vision board, which hangs on the wall next to my bed. Looking at my vision board reminds me of my Big Whys, what is most important to me, what I want to manifest in my life, and who I am when I am at my best. Every item on my vision board sparks joy and boosts my energy. For an extra special bonus, I give my hands and feet a massage while spending time with my vision board. First, I roll my feet on a foot massager, which feels really great. I might even massage my feet with my hands, too. Then I massage my hands either with Chinese health balls, my own hands, or by rolling homemade lavender putty in my palms. The latter is currently my favorite. Think playdough for grownups! It feels so relaxing to roll the putty around in my hands, making balls and snakes, just like when I was a child (and a kindergarten teacher)! It seems to massage the pressure points in the hands, in a fun way. Another bonus morning ritual is a half-hour of home yoga practice. My favorite resource is Yoga with Adriene on YouTube. Every year, she kicks off the new year with 30 days of yoga. This year, the series is called True. Last year, it was Revolution, and the year before that was Yoga Camp. When I finish one series, I go to one of the others, and there are plenty of videos to last the whole year – and they are free! Adriene’s message is all about self-love and finding what feels good. I’ve been doing yoga long enough to really feel the difference it makes in my body and mind. It makes me more aware of the energy in my body and where I’m holding tension. I’ll often become aware of my feet when I’m standing in line somewhere, and it’s a pleasant experience that takes me out of the thinking mind, reconnects me to my body, and deepens my breathing and relaxation response. Once, I was waiting in line at the bank, and the customers in front of me had business that took a long time. I became aware of my feet, then aware of the energy in my body, and it was like doing a body scan meditation! When it was my turn, the teller said he couldn’t believe how patient I was. There are lots of benefits of yoga, and that’s just one of them. It seems to get the energy flowing more smoothly through my body. I tend to live in my head, and yoga really helps me to more fully embody the experience of having a body. It takes my attention away from my thoughts and emotions and is a portal to deeper presence and relaxation. So those are my morning rituals! I love creating rituals. The possibilities are endless. It’s all about the mindfulness and positive energy they generate – which is why I do them every day. Occasionally, something will come up, and I won’t have time to do all of them, but I resist the temptation to use that as an opportunity to feel bad. I tell myself it’s not the end of the world. Mornings like that happen, and tomorrow is a new day! It’s more fun to wake up and get out of bed when I have something to look forward to, and these morning rituals are a positive, uplifting way to start the day.